There are certain perils to watching a TED Talk live from the audience – occasionally you’ll be asked a stumper of a philosophical question or made the brunt of a speaker’s joke. Then again, you might be given seven and a half extra minutes to live, so it’s really a toss-up. 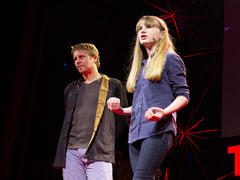 In these talks, pulled from a range of TED and TEDGlobals, watch for audience members getting in on the fun. And make sure to tune into the TED Blog staring Monday, February 25, for our live coverage of TED2013. We’ll be writing about every speaker, as well as all the action on-site in Long Beach, Califorinia. Arthur Benjamin: A performance of "Mathemagic"
Armed with standard calculators, audience members at TED2005 race mathemagician Arthur Benjamin through a dizzying maze of digits – and lose. At 8:05, he matches audience members’ DOB with the day of the week they were born. Game designer Jane McGonigal’s SuperBetter helped her recover from a head injury. At TEDGlobal 2012, she passes on the healing to the audience, granting them 7.5 extra minutes of life. At 13:00, watch the life-extending action begin. 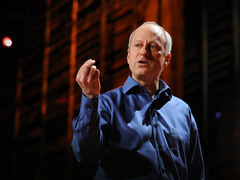 For philosophy professor Michael Sandel, lively debate is the key to a strong democracy – so he calls on the attendees of TED2010 to bring it back. Throughout the talk, audience members share thoughts on Aristotle and on a then-recent Supreme Court decision. 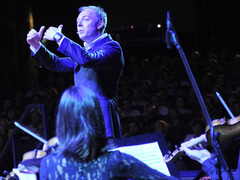 “Did you know that TED is a tune?” asks conductor Charles Hazlewood at TEDGlobal 2011. 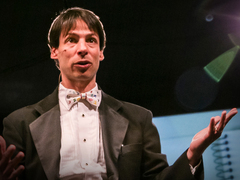 Starting at 8:48, he leads the audience in rousing chorus inspired by the letters T-E-D.
Neuroscientist Beau Lotto pulls the audience into some moments of playful discovery onstage at TEDGlobal 2012. In this talk about the joy of scientific inquiry, his slides show off a language gotcha!. At 12:35, he calls a fellow TED Speaker up to be experimented on. 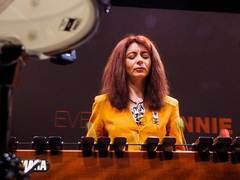 Music can be heard with your whole body, says Grammy-winning deaf percussionist and composer Evelyn Glennie. At TED2003, she asks the audience to listen differently, to rethink music and, at 12:15, to clap the sound of falling snow. 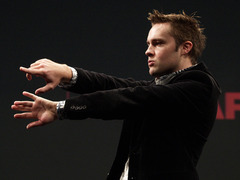 One after another, audience members are bedazzled and baffled by Keith Barry’s psychokinetic hijinks at TED2004. He creates phantom sensations, guesses names of ex-boyfriends and narrowly misses one very sharp object. A firm called Legit Script (LegitScript.com) claims to be protecting people by labeling legitimate Canadian and other non-U.S. pharmacies as “Unapproved” or “Rogue.” This serves the big pharmaceutical interests but not the American consumer. More than that, its founder, John Horton, appears to have exploited his former government position to establish LegitScript.com for his own gain. As we see it, Horton was setting the stage for his company, LegitScript.com, to use this “U.S. only” standard to displace PharmacyChecker.com as the leading certifier of online pharmacies and to pressure the search engines into blocking advertising of lower cost pharmacies in Canada and elsewhere. While Horton was a government employee, on March 20, 2007 his company’s domain name legitscript.com was registered: legitscript.com WHOIS domain registration information from Network Solutions. On April 16, 2007, Horton’s government office submitted the paper quoted above to Congress and, having planted the seed, Horton immediately left office and registered LegitScript as a for-profit company in Virginia and, later, as a not-for-profit entity in his home state of Oregon. Horton apparently approached the search engines and others to promote the use of LegitScript and/or VIPPS in place of PharmacyChecker.com (and it’s not surprising that VIPPS now endorses LegitScript as a reputable verification service). Perhaps rebuffed by these companies, Horton issued two reports, each focused on a different search engine, and each claiming that over 80% of pharmacy advertisers found were “illegal” or “rogue” when, in fact, most of these were licensed foreign pharmacies selling real medicine and requiring prescriptions. From his trumped up research, Horton went on to make the outrageous accusation that search engines were “sponsors” of rogue Internet pharmacies tied to “foreign (mainly Russian, Eastern Europe, and Chinese) organized criminal networks that are thought to fund other illicit activities including, in some cases, terrorism.” There is little doubt that LegitScript.com’s intention was to embarrass the search engines and cast doubt on the PharmacyChecker.com Verification Program. Despite LegitScript’s efforts, traffic to its site has been scant — less than 900 unique visitors per month in January 2010, compared to 104,000 per month to PharmacyChecker.com (legitscript.com’s (rank #217,488) Site Profile | Compete). However, as we see it, Horton’s purpose was not to help consumers find safe and affordable pharmacies, but to help deny Americans, especially the uninsured, access to lower priced medications. He has revealed his purpose in several ways: He dissolved LegitScript as a non-profit organization in Oregon on April 8th, 2009 and then registered LegitScript as a for-profit LLC on August 17th, 2009. At the same time, records at the Oregon Secretary of State Corporation Division show that Horton registered a firm called Evergreen Government Relations, giving the same address as LegitScript, apparently expecting to cash in on his government connections and influence on the behalf of corporate clients. A week earlier, on August 10th 2009, he abandoned his registration at the U.S. Trademark Office to use “LegitScript Certified” as a certification mark for Internet pharmacies. Working for companies to get government agencies to pressure search engines and domain registers is where the action is for John Horton. LegitScript.com adamantly denies that it is a “front for big PhRMA” and claims that it is funded by its employees. But unlike pharmacy verification groups like VIPPS and PharmacyChecker.com, it does not charge pharmacies a fee for its verification service. So where does its revenue come from, or where does Horton get the money to fund it? The website says it offers “market research reports” regarding the Internet pharmacy and online pharmaceuticals markets. And who might be the customers of such “research”? We think it’s fair to assume that its big pharma, including big US pharmacies. LegitScript.com may not expect to make money from its verification program, and it doesn’t care because its money may come from elsewhere. If LegitScript.com releases other “research reports,” keep in mind John Horton’s real agenda. And if search engines exclude safe, low cost pharmacies from advertising (and one recently did) or, worse yet, block them from appearing at all, we believe that LegitScript.com and John Horton, serving his masters, may have had a hand in it.